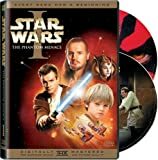 In preparation for Thursday's opening of Attack of the Clones, I re-watched Episode I, The Phantom Menace this week. Three years later, I was struck by a few things. First of all, it wasn't as bad as many are making it out to be. It wasn't the best Star Wars movie (in fact, it was the worst -- which is sort of the opposite of "damning with faint praise"), but it was very watchable. Jar-Jar was, in fact, annoying (mostly because of the inescapable conclusion that even if he wasn't intended as a racial stereotype, he ended up that way, and somebody should have changed the character on that basis). But I didn't find him incredibly annoying -- he didn't make "Wesley Crusher" on my scale. The main problem I had with the movie was that it was very flat. I didn't find myself engaged by the characters. Qui-Gon? Let's see, you have a Jedi on a negotiation mission. That's about all you get about him. Queen Amidala? Bo-ring. By design, I suppose, and Padme's the interesting one, but that gets obscured for most of the movie. Anakin? Look, I know it's a movie for kids, but does it have to be a movie about kids? The original was the first without the second. Anakin in this movie doesn't provide the requisite "cool character" you need. Your Han Solo, your Chewie, your Princess Leia. Well, I take that back. There is Obi-Wan. Ewan McGregor does his best Alec Guiness, and the story from A New Hope helps bring his character to life. The first heart-pounding moment I had re-watching this -- the kind of moment I expect from Star Wars movies -- was during the light-saber battle with Qui-Gon, Obi-Wan and Darth Maul. After Darth Maul takes out Qui-Gon and Obi-Wan has to wait for that weird force field to let him at D.M., the tension is just palpable. I must admit, however, after seeing Clones, I can see more what Lucas was trying to do with Menace. I'll probably see it even more when I watch the DVD with the director's commentary. I don't think that will entirely redeem the movie for me, though.